MOSCOW, December 4. /TASS/. 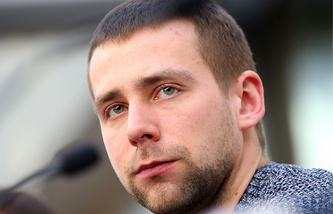 The Court of Arbitration for Sport (CAS) ruled on Tuesday to impose a four-year ban in regard to Russian Olympic curler Alexander Krushelnitsky citing violations of anti-doping regulations. "The Anti-Doping Division (ADD) of the Court of Arbitration for Sport (CAS) created for the PyeongChang 2018 Olympic Winter Games has issued its Final Award on Sanctions in the procedure between curler Aleksandr Krushelnickii (Olympic Athletes from Russia/OAR, mixed doubles curling) and the World Curling Federation (WCF)," the CAS reported in its ruling. "A four-year period of ineligibility commencing on 12 February 2018 has been imposed on Aleksandr Krushelnitsky," the statement said. The Swiss-based court added that the decision could be appealed within 21 days since the notification of the athlete at the issue.